This is a new feature to NY2L Flights: Hometown Guides. When it comes to travel, nothing beats hanging out with locals. If someone was visiting your city, wouldn’t you want them to trust your word instead of Tripadvisor or a generic guidebook? Let a local show you where to go. Are you a travel blogger? Have you lived somewhere in Europe for at least 3 months? Contact me to write a guest post like this one. Translation: Get out of the way, you’re obscuring my view. See also: Yer faither wisnae a glazier. to the tourists who stop in the middle of the pavement (sidewalk to all the Yanks) to take photos. The best way to kick off 48 hours in Edinburgh is to climb the 287 steps to the top of the Scott Monument. 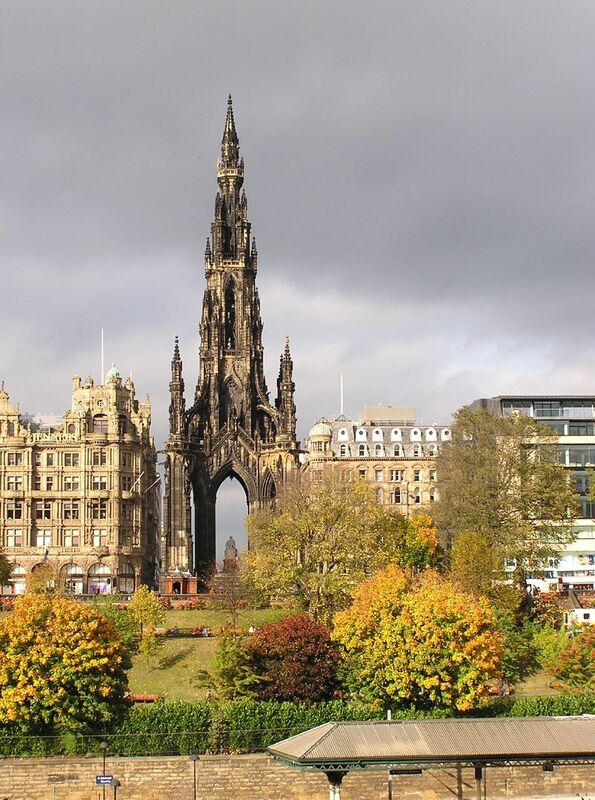 Constructed in 1848 to honor author Sir Walter Scott, it offers an amazing view of the city. From there you feel like you are on top of the world. The monument rests in the Princes Street Gardens, and offers stunning views of both New and Old Town. There is only one way up and down the tower, and the staircase is quite narrow, so it is not for the faint of heart. It gets a bit crowded in the summer months, but I’ve found that if you yell “I’m going to puke” really loud, people will let you out to see the views. When you’ve had enough of the views, pop in to Fredericks Coffee House. One word: Waffles. I had a religious experience with those waffles. I still dream about them. I am pretty sure if I ever have kids, I am going to name my first born after them. After you’ve finished your waffles, it is best to cross the road and enjoy a little redemption at a cheeky little pub called Hoot the Redeemer. Modeled in the feel of a really fun bar in 1950s New Orleans, Hoot offers you a wealth of possibility, and boozy slushies. You walk through a Tarot card reader to get into the pub, and on a Friday or Saturday night will most likely have to elbow people out of the way to get space, but the music is good, the staff is fun and the slushies do the trick. This is the actual door to the pub. You make it through her, and then you are ready for your hoot. You can walk through Princes Street and see the all of the fancy shops that tourists like to visit, but if you want to dodge that, looks for the hidden gems. Edinburgh is full of funky art shops that showcase and sell art made by people living right here in the city. While all of them have their own unique perks, there are two such places that are a cut above the rest. The first is a relatively new place: Flamingosaurus Rex. I love this place (and not just because it is like two of my favourite things mated and had an amazing baby). The people are really chill, the art they showcase is always changing, and their shop is easy to find. The second shop that is worth having a look is Die Doda. They have a few stalls around the city, with my favourite being in the Royal Mile Market on High Street. Beyond art, they have jewellery, candles, bags, and so much personality that you cannot help but love it. To respect them and their hard work, I will give you links to the art so you can see it from them, and buy something if the mood suits you. I’ve purchased several of their pieces as well as a handmade flamingo necklaces of delicate gold. Then you should take a walk down Victoria Street, one of the most colourful streets in the city, with a range of fun shops. It connects Grassmarket to Lawnmarket. At the top of the street there is a bookshop that has some amazing old maps and some wonderfully old books. For those who are interested in Scotch, the Bow Bar boasts the largest variety in the city. It is a tiny place, but worth the wait. Toward the bottom of the street there is a store called Museum Context. It is an interesting mix of museum and vintage shop. Last year my mother and I bought a WWI propeller for my dad. It is amazing. I have some vintage travel posters and postcards from the shop, and they are willing to ship anywhere in the world. On Grassmarket, there is a pub called Biddy Mulligans. They have live music most nights, fish and chips as large as your head, and Irish stew that would make you think you are sitting in your grandma’s kitchen (if your grandma is Irish of course, if not, then that image won’t work for you). If you are fan of farmers’ markets, the Stockbridge Market can’t be beat. Knitted finery, homemade fudge and sweets, cheese, and mouth-watering paella can be found in the stalls that are packed together. It is a busy place on a Sunday, but the people are nice, dogs are aplenty, and after the market, stroll through Stockbridge. This is considered one of the posh areas of the city, so just a warning, it can be a bit expensive. The city has some great charity shops though, with bargains on everything from boots, jackets, and dresses. The used bookstores are sprinkled throughout the city as well, and are full of poetic treasures and easy reads. 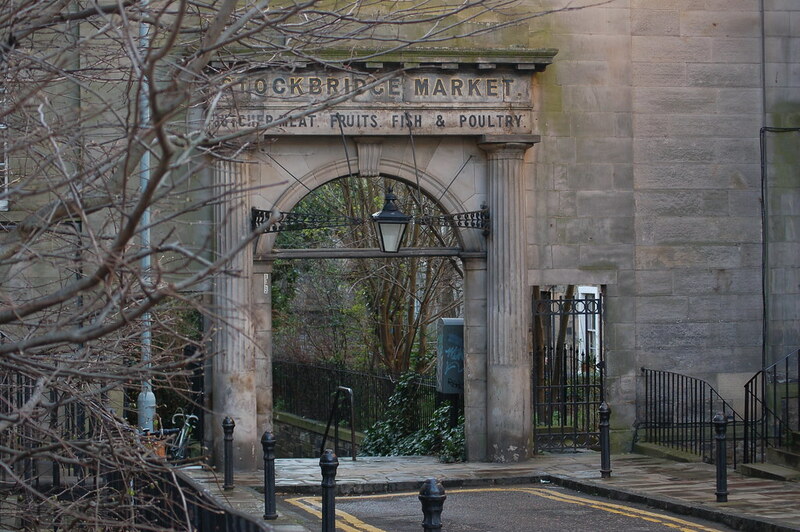 Bonus: Visit Circus Lane to see where I want to retire, and find the old Stockbridge Market sign. End your Sunday at market, head over to BrewLab for some coffee and treats. I’m not allowed to have caffeine (thanks genetics) but I hear tell that they make a fine cuppa. If you have more than 48 hours to spend in my fair city, then you can do all of the touristy things like visit the Castle, climb up Arthur’s Seat and visit all of the galleries and museums. They are all lovely. You can take day trips to find Nessie, to see William Wallace, and to find countryside and sheep galore. Interested in visiting Edinburgh? Check out these flight deals to Scotland. 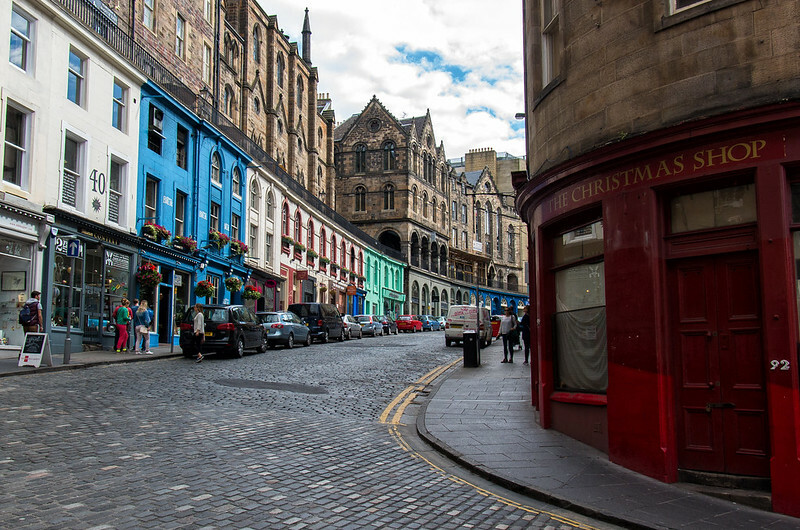 Kim writes about her life in Edinburgh at A Scamp Abroad. As a college undergrad she took an English literature class about Mark Twain (Nathan was in that same class). She takes her pirate rubber chicken with her wherever she travels.